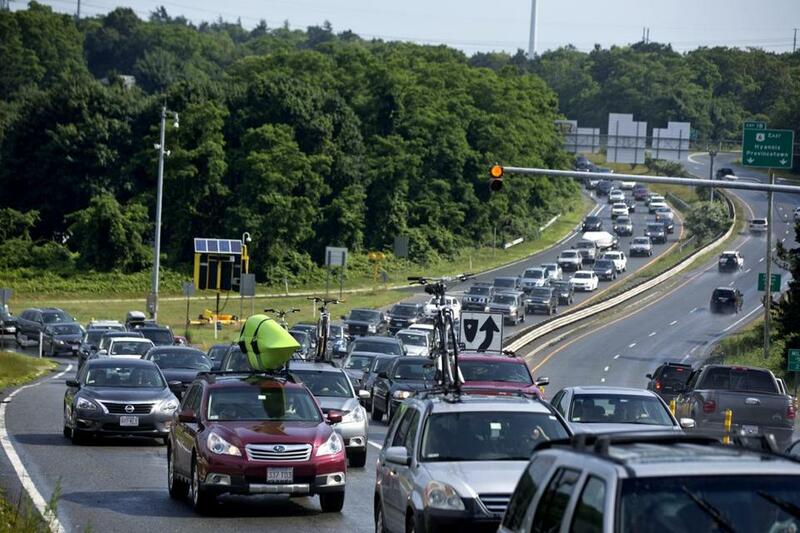 Traffic jams like this one near the Sagamore Bridge in July 2013 have boosted a proposal to use a public-private partnership to erect a third bridge across the Cape Cod Canal. Long sunny days on Coast Guard Beach. Lazy nights watching Cape Cod Baseball League teams battle for supremacy. And, of course, those countless hours stuck in a car on Route 6. It’s the most enduring of Cape Cod rituals, the snarl of traffic that traps drivers desperate to cross the canal. Now the state Department of Transportation is advancing a way to ease the pain: a new bridge, funded by private investors. The agency has focused on the possibility of adding a three-lane span next to the Sagamore Bridge. It would be limited to Cape-bound traffic, and drivers would pay a toll to use it. 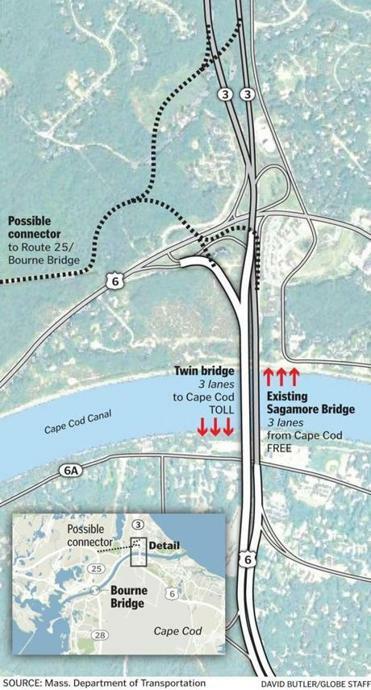 The Sagamore, meanwhile, would become a one-way, three-lane bridge to handle traffic coming off the Cape, with no toll. Those who don’t want to pay to get across the canal could still take the Bourne Bridge, nearly 4½ miles away. Sitting on Route 3 southbound again? The state may have a solution. The notion of another canal crossing has been tossed around for years on the Cape, treated more as a joke than a real prospect. Remember those Cape Cod Tunnel permits, the prank stickers that locals planted on their car windows? A new bridge could be a decade away, but two major factors have emerged to make it a possibility. A formal effort is underway to find private investors willing to pay for highway projects in exchange for toll revenue. And then there is the arrival of open-road tolling that lets fares be collected without drivers having to slow and further clog traffic. 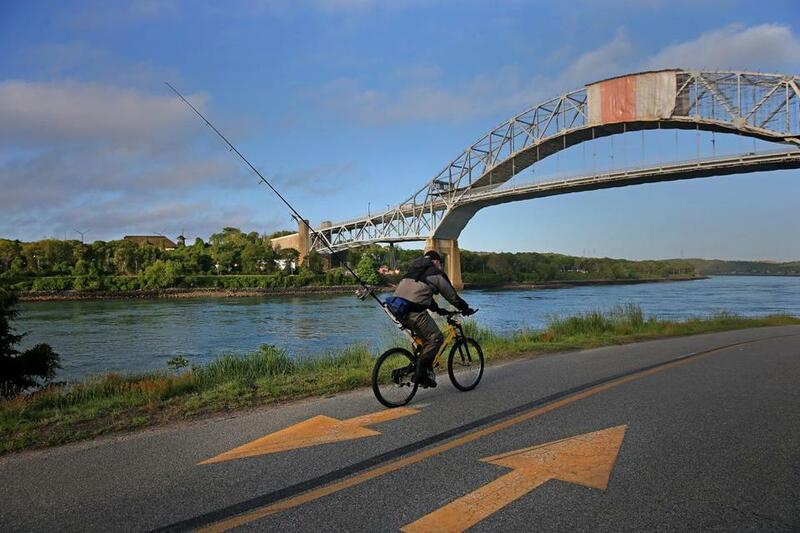 The state Department of Transportation has hired a Boston engineering firm, Fay, Spofford & Thorndike, to help study traffic patterns around the Cape Cod Canal. (The firm has a long local history, having designed the existing New Deal-era bridges.) 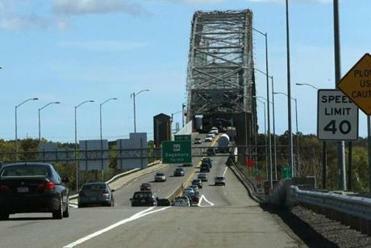 Later this summer, the state agency and the firm plan to assess the impact of a third bridge, as well as simpler fixes like lane changes and signal upgrades, Transportation Department spokesman Michael Verseckes confirmed. The agency plans to use the results, expected by the end of the year, to decide whether to move ahead with a new bridge. Don’t expect to zip over a shiny new span anytime soon. Even if the study shows that a third bridge would have favorable traffic impacts and be economically viable, the state must find a private-sector partner to finance the roughly half-billion dollars needed for construction. The Army Corps of Engineers — which owns the existing bridges and has controlled the canal since the late 1920s — also needs to be convinced. And the hardest sell could be to skeptical Cape Cod residents: Highway officials say they will not go ahead without local support. The proposal is still so new that many year-rounders don’t even know about it yet. All told, the permitting and construction could take six to 10 years. The traffic jams at the bridges are the stuff of summer legend. Roughly 70,000 vehicles can cross the Sagamore on a busy summer Saturday. But heavy congestion has spread into the spring and fall as lane closures for maintenance work increase in frequency. The Sagamore and the Bourne bridges, largely unchanged from when they were built in the 1930s, are simply insufficient for today’s demands. The lanes are narrow, the sidewalks unfriendly for pedestrians and cyclists. There is no room for a breakdown lane. Replacing the old Sagamore Rotary with a “flyover” in 2006 made a dent in the traffic problems but did not come close to solving them. Then, in 2009, the Legislature passed a transportation law that authorized the Department of Transportation to enter into partnerships with private investors for road and bridge construction: The agency staff would assess proposals before taking the best of them to a state-appointed commission for guidance and approval. But the commission didn’t come together until 2013. That same year, state engineers, intent on solving the Cape’s traffic woes, hashed out a novel concept: a privately funded bridge next to the Sagamore. That July, transportation administrator Frank DePaola ran the idea past Wendy Northcross, chief executive of the Cape Cod Chamber of Commerce. Northcross quickly embraced it, and her group emerged as one of its most powerful advocates. Enlisting private investors to build roads and bridges is not a new idea, although none of these projects exist in Massachusetts yet. Examples elsewhere date to the 1990s in the United States, and long before that in Europe and Australia. And they are appearing with increasing frequency as highway officials look for creative ways to finance ambitious projects. One of the first examples in the Northeast is the $1.5 billion Goethals Bridge replacement, underway between New Jersey and Staten Island. It is being financed and built by the Australian financial giant Macquarie Group and a Nebraska builder, Kiewit Corp., for the local port authority. There is nothing to stop a developer from trying to renegotiate the tolls or filing for bankruptcy protection, one expert said. When Massachusetts transportation officials held an event in October for potential investors in a Cape bridge and a separate high-speed toll lane along Route 3, more than 100 people showed up, signaling potentially strong interest. The Army Corps, meanwhile, is embarking on its own review of the existing bridges to determine whether the aging spans need to be renovated or replaced. If the Army Corps moves ahead with fixes, however, the focus would not be on adding lanes to alleviate traffic. A decision on that front would not come until at least 2017, and DePaola said he does not want to wait much longer. There are potential pitfalls, of course, in outsourcing public infrastructure development to private companies. Cliff Winston, a transportation expert at the Brookings Institution, said there is nothing to stop a developer from trying to renegotiate the tolls or filing for bankruptcy protection if revenue falls short of expectations. Robert Poole, transportation policy director at the libertarian-leaning Reason Foundation, sees it differently: He said that public-private partnerships can be a more efficient way to handle big infrastructure projects. A private developer, he said, does not need to focus on the lowest bidders, a frequent requirement with public contracts that can lead to costly problems later. “If the Big Dig was done as one of these things, it almost certainly would have turned out differently,” Poole said. But tolls could prove a sticking point for Cape Cod residents who have a love-hate relationship with the crowds that flock to the beaches every summer. Discounted or free tolls could be offered to people who live near the bridge. Many regular users, though, may end up paying the full cost. That could spark opposition, which state officials hope to avoid. “They work and live and play in that area and do not feel like they should have to pay a toll to go from one side of their community to another,” said state Senator Vinny deMacedo, a Plymouth Republican. State Senator Dan Wolf said he thinks the state should first consider allowing a public agency to do the job. The Harwich Democrat said private investors would want an annual return of 10 to 12 percent or more, driving up the price of the tolls required to pay for it. “The bar needs to be very high in projects where we are in effect selling public infrastructure for private companies to gain or profit,” said Wolf, Cape Air’s chief executive. Many business owners and executives do not care who owns the new bridge. They just want it to get built. Bill Zammer, owner of the Coonamessett Inn and Flying Bridge restaurants in Falmouth, said traffic is so bad that he has recommended several times that wedding parties hold cocktail hours before the main event to allow time for guests who are snagged at the canal. He’s tired of the headaches. So are the brides.